Michael Litt, founder and owner of Akron’s Nervous Dog Coffee Bar, summarizes his business philosophy as “We don’t just sell coffee; we sell community.” Thanks to his passion for both, Nervous Dog celebrated its tenth anniversary last month. Litt was a management consultant pursuing his MBA when he began questioning whether he was leading the life he wanted. Constantly on the road and with a child on the way, he wondered about the prospects for family life. At the same time, he noticed that Coco’s Coffee, the West Market coffeehouse that he passed on his regular commute, seemed to be foundering. He had already begun exploring the possibility of making an offer on the shop when he traveled to Ireland and England as part of his graduate program. He noted that each pub and coffee house he saw was more than a business—it was part of the community. “I sat down and ran the numbers. It is impossible to open a profitable coffee shop. I said ‘that’s interesting,’ and opened a coffee shop.” He bought Coco’s for the price of a used car. He credits his success to surrounding himself with people who share his passion for coffee, community, and people. When hiring baristas, he looks less at technical proficiency or experience in roasting and brewing coffee, and more at whether a candidate has a genuine interest in connecting with customers. As a result, a community has sprung up around Nervous Dog that built the business figuratively and literally. For example, the pergola and patio at the Akron shop were built by customers. 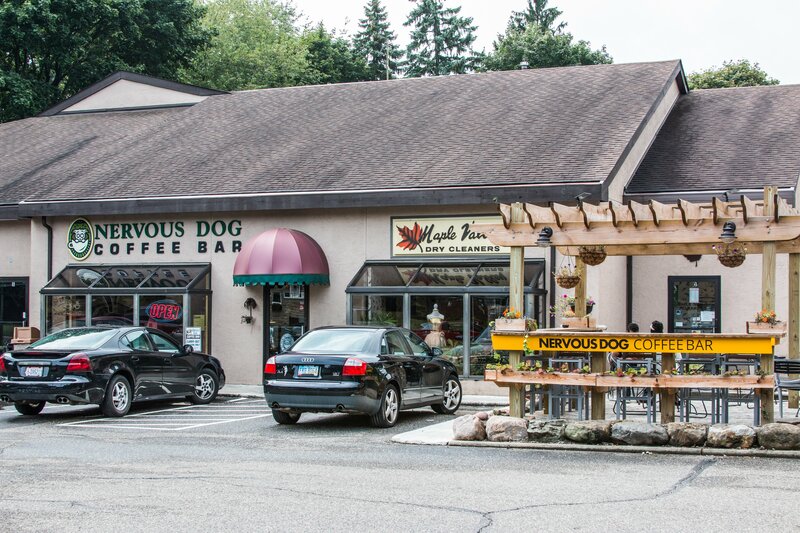 Nervous Dog currently consists of the first shop on West Market in Akron and a location in Stow established four years after the first location opened. Like his initial foray into the coffee business, the expansion was precipitated by a favorite haunt going out of business. Like the Akron location, the Stow shop was redesigned to make it “warmer.” But the Stow and Akron locations differ, partly because each is accented with a different array of antiques, but also because everyone participates in the redecoration. Each shop reflects the idiosyncrasies of the community that helped build it. Litt is now planning further expansion. A Beachwood location is scheduled to open by the end of October, with further expansion likely. As part of the expansion effort, Litt secured the services of a marketing company. In their research they boiled the Nervous Dog difference down to one word: friendly. 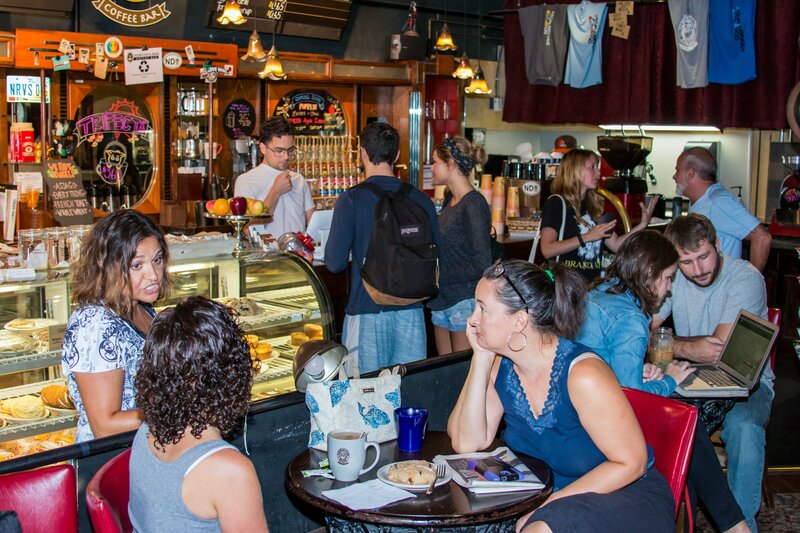 Regarding the major coffeehouse chains, he observes that “the corporations are duking it out over profit margins—in and out.” In contrast, Litt is unconcerned about “campers”—the customers who buy one cup of coffee, then occupy a seat for three or four hours. Instead, he sees his regular campers as part of the ambiance. While building community is at least half of the business, Litt never neglects the product. With a caffeine molecule tattooed on his left forearm, he is clearly a coffee man. He notes that some chains have been accused of over roasting beans to cook out crop-to-crop variations in flavor. He would rather celebrate those variations than cover them up. In addition to new locations, Litt is working on a new, community-friendly venture offering bags of Nervous Dog coffee to student groups and small local charities which they can sell to raise funds.